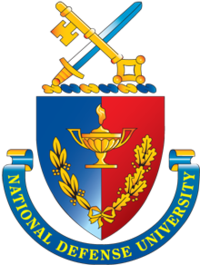 For other national defense universities, see National Defence University (disambiguation). The National Defense University (NDU) is an institution of higher education funded by the United States Department of Defense, intended to facilitate high-level training, education, and the development of national security strategy. It is chartered by the Joint Chiefs of Staff, with Vice Admiral Fritz Roegge, USN, as president. It is located on the grounds of Fort Lesley J. McNair in Washington, D.C.
"The university's mission is to support the joint warfighter[definition needed] by providing rigorous Joint Professional Military Education to members of the U.S. Armed Forces and select interagency civilians in order to develop leaders that have the ability to operate and creatively think in an unpredictable and complex world." The school's master's program is a one-year intensive study program. Before 1946, the U.S. military relied on specially-created programs to meet specific needs. They also made use of smaller training programs elsewhere. The closer integration of military forces and increasing complexity of strategy and technology necessitated the foundation of The National War College and the Industrial College of the Armed Forces. To better integrate all the education programs, Congress created the National Defense University in 1976. In 1981, the Joint Forces Staff College was created, followed by the Department of Defense Computer Institute (DODCI) in 1982, which later was renamed the Information Resources Management College. In 1984 the university created the Institute for National Strategic Studies to meet the demand for military research. After the Goldwater-Nichols Act and the House Armed Services Committee Skelton Panel Report, the University decided to seek authority to grant master's degrees. In 1993 President Bill Clinton signed into law a bill that allowed NDU to grant the degree of Master of Science in National Resource Strategy upon graduates of the Industrial College of the Armed Forces, and the Master of Science in National Security Strategy upon graduates of the National War College. The university is accredited by the Middle States Association of Colleges and Schools. In December 2008, former U.S. Secretary of State Henry Kissinger was given the American Patriot Award by the National Defense University Foundation "in recognition for his distinguished career in public service." A practitioner of Realpolitik, Kissinger played a prominent role in United States foreign policy between 1969 and 1977. During this period, he pioneered the policy of détente with the Soviet Union, orchestrated the opening of relations with the People's Republic of China, and negotiated the Paris Peace Accords, ending American involvement in the Vietnam War. Kissinger has also been associated with such controversial policies as U.S. involvement in a military coup in Chile, a "green light" to Argentina's far-right military dictatorship for their dirty "war," and U.S. support for Pakistan during the Bangladesh War despite a genocide. After leaving government, he formed Kissinger Associates, an international geopolitical consulting firm. Earlier in 2008, a NDU professor had blown the whistle on the fact that a Chilean colleague at the William J. Perry Center for Hemispheric Defense Studies of U.S. Southern Command headquartered at the university had not only been a member of military dictator Augusto Pinochet's DINA death squad operation (the same organization responsible for the 1976 car bomb murder of former Chilean Foreign Minister Orlando Letelier and American aide Ronni Karpen Moffitt less than a mile from the White House), but was in addition accused of participating in the torture and murder of seven detainees in Chile. The whistleblower, Martin Edwin Andersen, was not only a senior staff member who earlier—as a senior advisor for policy planning at the Criminal Division of the U.S. Department of Justice—was the first national security whistleblower to receive the U.S. Office of Special Counsel's "Public Servant Award," but was also the same person who broke the story in The Nation on Kissinger's "green light" for Argentina's dirty "war." NDU Press publishes Joint Force Quarterly (JFQ) four times per year. As stated on their home page "JFQ is the Chairman's joint military and security studies journal designed to inform and educate national security professionals on joint and integrated operations; whole-of-government contributions to national security policy and strategy; homeland security; and developments in training and joint military education to better equip America's military and security apparatus to meet tomorrow's challenges while protecting freedom today." National Intelligence University, Washington, D.C.
^ a b "Vice Admiral Fritz Roegge, USN > National Defense University > Article View". www.ndu.edu. Retrieved 5 October 2018. ^ "National Defense University: Educating, Deverloping and Inspiring National Security Leadership". National Defense University. Retrieved 20 October 2017. ^ Bass, Gary (September 21, 2013). "Blood Meridian". The Economist. Retrieved February 13, 2016. ^ "No Good Deed Goes Unpunished: The Story of Whistleblower Martin Edwin Andersen". progressive.org. ^ Andersen, Martin Edwin (31 October 1987). "Kissinger and The "Dirty War"" (PDF). The Nation. Retrieved 2 December 2017. ^ Hitchens, Christopher (September 21, 2013). "Kissinger Declassified". Vanity Fair. Retrieved October 23, 2018. ^ "Colleges". www.ndu.edu. Retrieved 2018-08-03. ^ "Joint Force Quarterly (JFQ)". National Defense University Press. Retrieved 20 October 2017. Wikimedia Commons has media related to National Defense University. 1976 establishments in Washington, D.C.